« And another week’s gone. I think it’s prety adorable, if I do say so myself! You’ll want to play with this sketch this week – so many possibilities! Check out what Beate, Cami, Charmaine, Lori, Laurie, and Sharon did, too. It’s a fine way to start your weekend! So, so cute!! You can never go wrong with Maisy! Isn’t she just the cutest? Love your card. Perfect paper ‘scraps’ and bling. Have a fabulous, fun weekend. Hug Sharon! Ahh Jenn this is so cute, adorable image and love all the sparkly. She is definitely one blinged-out Bella … and too cute! She’ll be perfect for a girly birthday. Glad you got to stamp before leaving town — be safe and I’ll see you tomorrow (call me for timing). This is just darling! Love the bright colors and all the bling! Jenn.. this is cute as can be.. love the Bling! Love that paper, it’s so perfect! I SO wish I could stamp like you! 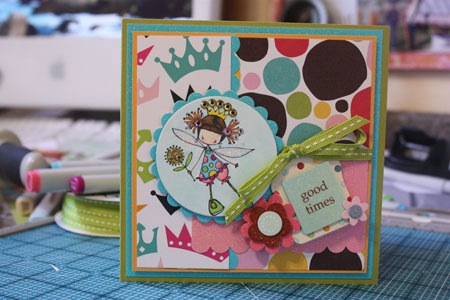 You just “pull” scraps together and make these AMAZING creations!! I am in awe!! Oh, and NO ONE does bling like you!! This is so cute, Jenn!! 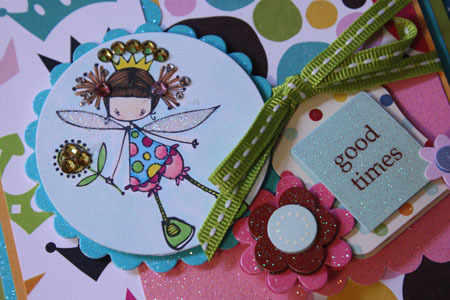 I love the colors on the card and her outfit and all the glittery accents and rhinestones! I think it’s ADORABLE as well. Everything about this card coordinates. Ummm, it’s the 20 minutes that has me shakin’ my head….girl, this amazing card in 20 minutes? YOU ROCK! Adorable card! I love all the bling and that Ketto is adorable! Wow! I love your card. Your coloring looks wonderful and the stamp is darling! LOVE the happy paper you chose. I hope you will have a wonderful weekend! This is so totally adorable!!! Love the fun colors and all the bling! She is sooo cute, and I love the fun papers!! Your bling and sparkle looks so pretty as well!! This is ugly. I do not like this card.